Actor Terrence Howard (”Empire”) is 49 on March 11. March 11: Singer Mark Stein of Vanilla Fudge is 71. Singer Bobby McFerrin is 68. Movie director Jerry Zucker is 68. Singer Cheryl Lynn is 67. Actress Susan Richardson (”Eight Is Enough”) is 66. Recording executive Jimmy Iovine (”American Idol”) is 65. Country singer Jimmy Fortune of The Statler Brothers is 63. Actress Alex Kingston is 55. Actor Wallace Langham (”CSI”) is 53. Singer Lisa Loeb is 50. Keyboardist Al Gamble of St. Paul and the Broken Bones is 49. Singer Pete Droge is 49. 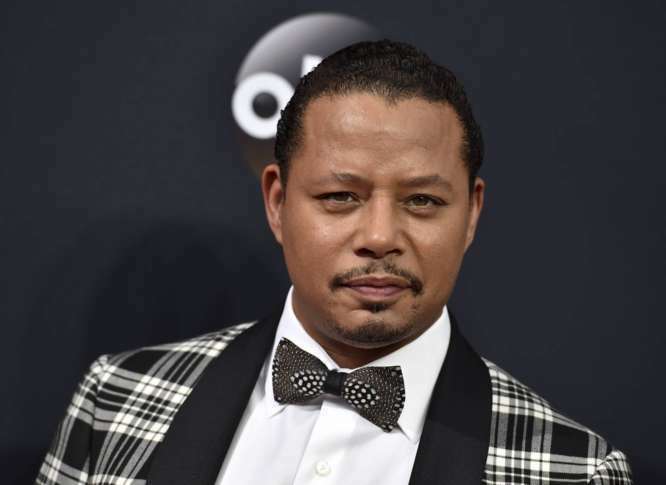 Actor Terrence Howard (”Empire”) is 49. Actor Johnny Knoxville is 47. Musicians Joel and Benji Madden of Good Charlotte are 39. Actor David Anders (”iZombie,” `’The Vampire Diaries”) is 37. Singer LeToya Luckett (Destiny’s Child) is 37. Actress Thora Birch (”Ghost World,” `’American Beauty”) is 36. TV personality Melissa Rycroft is 35. Actor Rob Brown (”Blindspot,” “Treme”) is 34. March 12: Actress Barbara Feldon (”Get Smart”) is 85. Actress-singer Liza Minnelli is 72. Singer-songwriter James Taylor is 70. Singer Bill Payne of Little Feat is 69. Actor Jon Provost (TV: “Lassie”) is 68. Bassist Steve Harris of Iron Maiden is 62. Actress Lesley Manville (”Phantom Thread”) is 62. Singer Marlon Jackson of The Jackson Five is 61. Actor Courtney B. Vance is 58. Actor Titus Welliver (”Deadwood”) is 56. Actress Julia Campbell (”Romy and Michelle’s High School Reunion”) is 55. Actor Aaron Eckhart (”The Dark Knight”) is 50. Guitarist Graham Coxon of Blur is 49. Drummer Tommy Bales of Flynnville Train is 45. Actor Rhys Coiro (”Hostages,” `’Entourage”) is 39. Country singer Holly Williams is 37. Actor Jaimie Alexander (TV’s “Blindspot”) is 34. Actor Tyler Patrick Jones (”Ghost Whisperer”) is 24. Actress Kendall Applegate (”Desperate Housewives”) is 19. March 13: Singer-songwriter Neil Sedaka is 79. Actor William H. Macy is 68. Comedian Robin Duke is 64. Actress Dana Delaney is 62. Bassist Adam Clayton of U2 is 58. Jazz trumpeter Terence Blanchard is 56. Drummer Matt McDonough of Mudvayne is 49. Actress Annabeth Gish (”The West Wing,” `’The X-Files”) is 47. Actress Tracy Wells (”Mr. Belvedere”) is 47. Rapper Common is 46. Rapper Khujo of Goodie Mob is 46. Singer Glenn Lewis is 43. Actor Danny Masterson (”That `70s Show”) is 42. Musicians Natalie and Nicole Albino of Nina Sky are 34. Actor Emile Hirsch (”Into the Wild”) is 33. March 14: Singer Phil Phillips is 92. Actor Michael Caine is 85. Composer-conductor Quincy Jones is 85. Comedian Billy Crystal is 70. TV and radio personality Rick Dees is 67. Country singer Jann Browne is 64. Actor Adrian Zmed is 64. Actress Tamara Tunie (”Law and Order: SVU”) is 59. Actress Penny Johnson Jerald (”Castle,” `’24”) is 58. Actress Elise Neal (”All of Us”) is 52. Actor Gary Anthony Williams (”Boston Legal,” `’Malcolm in the Middle”) is 52. Drummer Michael Bland of Soul Asylum is 49. Singer Kristian Bush of Sugarland is 48. Actress Betsy Brandt (”Breaking Bad”) is 45. Actress Grace Park (”Hawaii Five-0,” `’Battlestar Galactica”) is 44. Actor Daniel Gillies (”The Originals,” `’Vampire Diaries”) is 42. Actor Corey Stoll (”House of Cards,” `’The Bourne Legacy”) is 42. Actor Chris Klein is 39. Actor Ryan Cartwright (”Kevin Can Wait”) is 37. Actress Kate Maberly (”Finding Neverland”) is 36. Singer-keyboardist Taylor Hanson of Hanson is 35. Actor Jamie Bell (”Billy Elliot”) is 32. Bassist Este Haim of Haim is 32. Actor Ansel Elgort (”Insurgent,” `’Divergent”) is 24. March 15: Elvis Presley drummer DJ Fontana is 87. Actor Judd Hirsch is 83. Bassist Phil Lesh of the Grateful Dead is 78. Singer Mike Love of the Beach Boys is 77. Singer-keyboardist Sly Stone of Sly and the Family Stone is 75. Guitarist Howard Scott of War is 72. Rock guitarist Ry Cooder is 71. Singer Dee Snider of Twisted Sister is 63. Actress Park Overall (”Empty Nest”) is 61. Model Fabio is 57. Singer Bret Michaels of Poison is 55. Singer Rockwell is 54. Actor Chris Bruno (”The Fosters”) is 52. Singer Mark McGrath of Sugar Ray is 50. Bassist Mark Hoppus of Blink 182 and of Plus-44 is 46. Singer-guitarist Matt Thomas of Parmalee is 44. Actress Eva Longoria is 43. Musician will.i.am of Black Eyed Peas is 43. DJ Joseph Hahn of Linkin Park is 41. Rapper Young Buck is 37. Bassist Ethan Mentzer of The Click Five is 35. Actor Kellan Lutz (The “Twilight” films) is 33. March 16: Movie director Bernardo Bertolucci is 77. Game-show host Chuck Woolery is 77. Singer-songwriter Jerry Jeff Walker is 76. Actor Victor Garber (”Alias”) is 69. Actor Erik Estrada is 69. Country singer Ray Benson of Asleep at the Wheel is 67. Guitarist-singer Nancy Wilson of Heart is 64. Actor Clifton Powell (”Ray,” `’Norbit”) is 62. Rapper Flavor Flav of Public Enemy is 59. Actor Jerome Flynn (”Game of Thrones”) is 55. Folk singer Patty Griffin is 54. Singer Tracy Bonham is 51. Actress Lauren Graham (”Parenthood,” `’Gilmore Girls”) is 51. Actor Judah Friedlander (”30 Rock”) is 49. Actor Tim Kang (”The Mentalist”) is 45. Singer Blu Cantrell is 42. Actor Brett Davern (”Awkward”) is 35. Singer Jhene Aiko is 30. March 17: Singer-songwriter John Sebastian of the Lovin’ Spoonful is 74. Percussionist Harold Brown of War is 72. Actor Patrick Duffy is 69. Actor Kurt Russell is 67. Country singer Susie Allanson is 66. Actress Lesley-Anne Down is 64. Actor Mark Boone Jr. (”Sons of Anarchy”) is 63. Country singer Paul Overstreet is 63. Actor Gary Sinise is 63. Actor Christian Clemenson (”CSI: Miami”) is 60. Actress Vicki Lewis (”NewsRadio”) is 58. Actor Casey Siemaszko (”NYPD Blue”) is 57. Actor Rob Lowe is 54. Singer Billy Corgan of Smashing Pumpkins is 51. Bassist Van Conner of Screaming Trees is 51. Bassist Melissa Auf der Maur (Smashing Pumpkins, Hole) is 46. Drummer Caroline Corr of The Corrs is 45. Singer Keifer Thompson of Thompson Square is 45. Actress Marisa Coughlan (”Boston Legal,” `’Freddy Got Fingered”) is 44. Rapper Swifty of D12 is 43. Actress Brittany Daniel (”It’s Always Sunny in Philadelphia”) is 42. Bassist Geoff Sprung of Old Dominion is 40. TV personality Rob Kardashian is 31. Singer Hozier is 28. Actress Eliza Hope Bennett (”Nanny McPhee”) is 26. Actor John Boyega (”Star Wars: The Force Awakens”) is 26.